Finally, a Porsche EV. The German automaker plans to launch its first all-electric model, a street version of the Mission E concept, in 2019. In an interview with Car Magazine, Porsche CEO Oliver Blume said the Mission E will start at around $85,000. Porsche previously has said that the four-seat, four-door sports car would deliver around 300 miles of range on a single charge and boast a top speed in excess of 155 mph. That certainly makes it competitive with the current generation Tesla Model S, although things can change a lot in two years. One thing that might not change much, though, is the Mission E concept’s slippery design, first shown when the concept car debuted at the 2015 Frankfurt Auto Show. 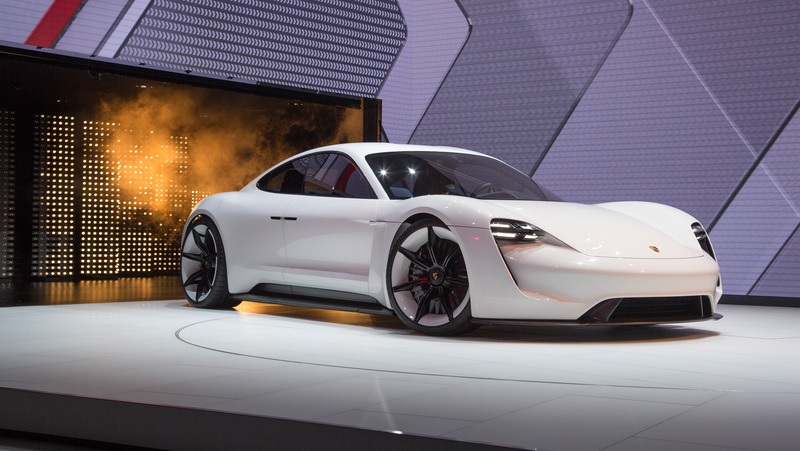 Blume told Car that the Porsche EV’s design “is fixed” and that while “a bit different” from the original concept it still will be “very close to what you saw” on the podium at the 2015 show. Concept car details released that the time included 0-62 mph acceleration in just under 3.5 seconds from a 600 horsepower, duel electric-motor system with four-wheel drive and four-wheel steering. Inside, the car is configured for four occupants, and some infotainment functions are expected to operated via gesture control. The production Porsche EV will come with the capability to charge with the 800-volt, 350 kW rapid charging systems being developed. When hooked up to one, the Mission E – or whatever the production model’s name will be – would be able to take on an 80 percent recharge, good for 250 miles, in about 15 minutes. Present-day fast-charging systems are limited to 150 kW – 80 percent in half an hour – and some operate at just 50 kW. While fast charging stations in the U.S. so far are in that 50-150 kW range, Volkswagen – Porsche’s corporate parent – is installing 320 kW chargers in California as part of its settlement in the “dieselgate” diesel emissions cheating scandal. Additionally, charging systems maker ChargePoint has developed a 400 kW Express Plus charger.